While design-wise this month’s mandala looks rather simplistic, it actually allows you to make it as intricate and detailed as you want it to be. The control of its destiny is in your hands. Think of this mandala as an expression of how you really want to be in this world. What images or colors would fill the “sun” (heart/soul) area? What’s in the background supporting you? What fears/blocks (things in front of the sun) have kept you from moving forward? What gifts (ribbons) have you yet to fully unveil to the world. “Reaching Out” encourages us to fully extend ourselves, to grow into the ones we are truly meant to be. Yes, it’s scary and we risk being vulnerable… on the other hand, waiting until things are just right may never happen. It not now…when? A great resource for working through our fear of vulnerability, is the work of Dr. Brené Brown. Her new book “Daring Greatly” uses Roosevelt’s quote as inspiration along with the 12 years of research on shame, vulnerability, and more importantly on living a whole-hearted life. I highly recommend her 2 TED talks. Another perspective on reaching out…people are waiting in the wings, waiting for you to be fully out there so that you can help them, show them how it’s done. 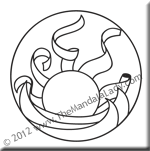 Be sure to download Section 10 of the 2012 Mandala of the Year.